Medicine as a field does not just treat illnesses — it treats human beings. In providing care for these patients, there are some complications that arrive that get in the way of quality care. That’s where Cloudbreak Health comes in. The leading telemedicine platform provides assistance for non-english speakers, deaf patients, and patients with varying mental impairments for the best care possible. Born from two existing companies, Martii and Carenection, Cloudbreak Health is unifying telemedicine and healthcare solutions. LA TechWatch chatted with Jamey Edwards about the startup and how they are holding healthcare to a higher standard. Cloudbreak Health is a leading telemedicine platform performing over 70,000 encounters per month in over 650 hospitals. 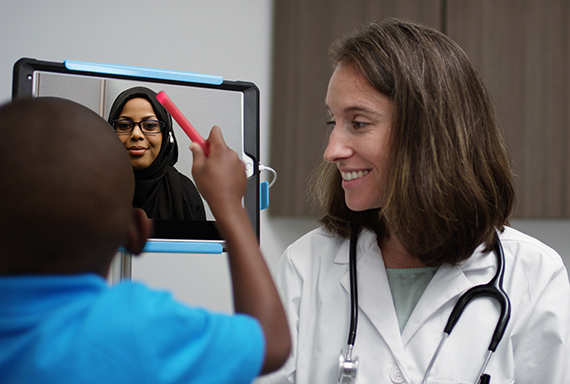 Whether helping Limited English Proficient (LEP) and Deaf patients communicate with their physicians, bringing stroke neurologists to communities in need or telepsychiatrists to those with mental health issues, the Cloudbreak platform helps improve access to high quality care at the push of a button and reduce healthcare disparities. Cloudbreak has pioneered unified telemedicine, or bringing all healthcare specialties together on a single platform. 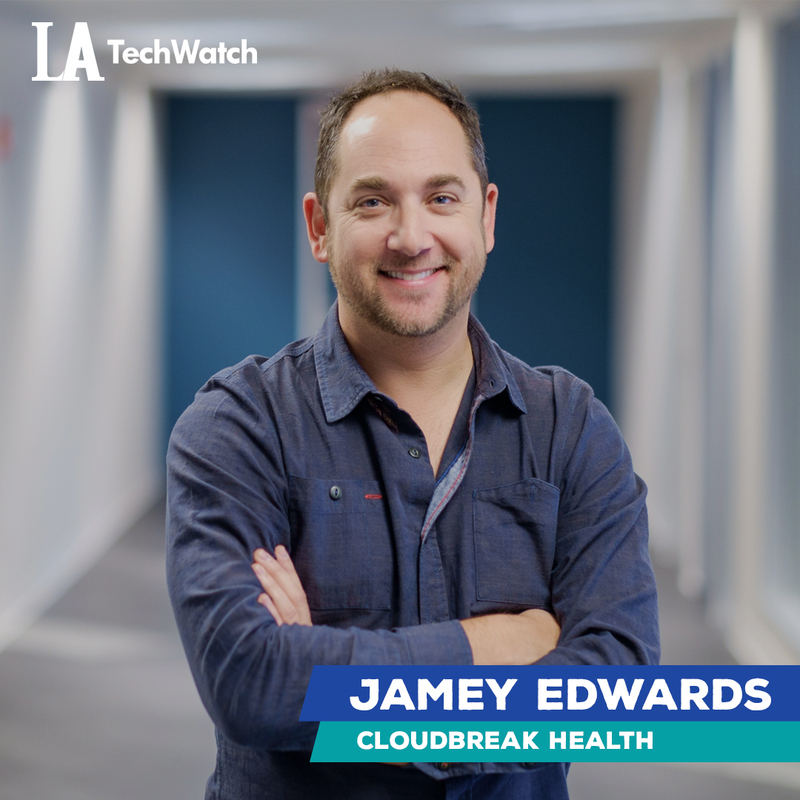 Available on iOS, Android and PC devices, Cloudbreak’s innovative video interoperability allows hospitals on disparate technology solutions to collaborate seamlessly, sharing critical resources w/ each other that were simply not possible prior. The platform is also one of the first in the country to follow the patient from home to the hospital and back again enabling a patient’s existing continuum of care with telemedicine instead of creating a new one. In fact, Cloudbreak was the first company to bring a language interpreter into a telemedicine call. For these innovations, as well as others, the company was recently recognized with a Patrick Soon-Shiong Innovation Award. 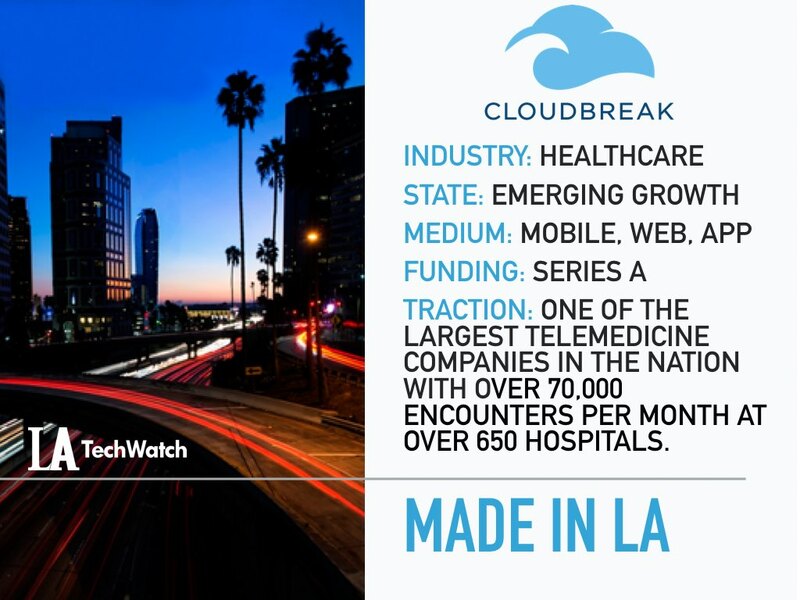 Cloudbreak operates in the healthcare market in two sectors, telemedicine and language services. The telemedicine market is well north of $1.5B and represents the fastest growing segment of healthcare. We partner with healthcare providers to enable their telemedicine initiatives. They can private-label our platform and use it across the healthcare enterprise. We refer to this as TaaS or Telemedicine as a Service. Our subscription based pricing model is directly aligned with our partner healthcare facilities and is built around driving patient engagement, one of the main challenges of telemedicine today. How were you able to scale in telemedicine – a fragmented and competitive space? We initially had to build a service for the platform to help solve the typical chicken or egg challenge. We built out a category leading video medical interpreter solution which is truly a gateway telemedicine application and an easy to understand use case for our healthcare partners. We have since expanded past that revolutionary service and evolved into a broader provider of enterprise telemedicine solutions. We had built one of the largest private broadband networks optimized for telemedicine in the country, matched it a software platform that scaled reliably and gave it access to our network of thousands of providers who could consume or provide services to the rest of the network. Tell us a little about your background and what inspired the business? I am a previous investment banking and private equity professional who made the jump to healthcare operator over 10 years ago. I was the CEO of another healthcare company (an ER, Hospitalist and Anesthesia group) and helped build that group from a six-site company into the leading group in the Southwest seeing over one million patients per year. While there, I learned of the predecessor company to Cloudbreak, the Language Access Network. We engineered a deal to take it private and then grew it into what it is today. 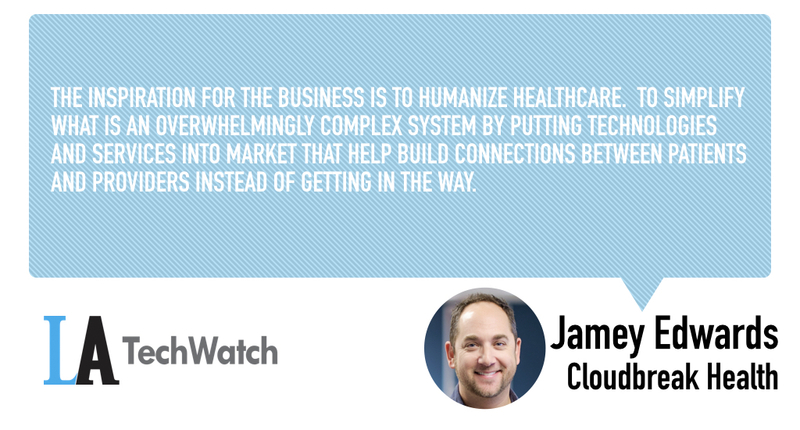 The inspiration for the business is to humanize healthcare. To simplify what is an overwhelmingly complex system by putting technologies and services into market that help build connections between patients and providers instead of getting in the way. Tell us what building your company in LA has been like? Building the company in LA has been amazing. While we have a nationwide presence now in multiple states, California and LA culture has definitely become a core part of our company culture. We are named after a surf break after all. The key aspects of LA, its creativity, free thinking, progressive nature, etc…have helped us create a fun company driven by a mission. We can pull from the great pool of talent available locally and our team loves congregating in LA for our nationwide strategic planning sessions. Being a part of Silicon Beach and helping drive healthcare forward here has been really rewarding. Our goal is to continue to grow rapidly and close our Series B financing round. I have met so many of the great investors here in LA. Whether it’s the teams from March Capital Partners, Crosscut Ventures or Upfront Ventures. I guess I would have to say Mark Suster. I still haven’t met him and have a ton of respect for his investing ethos and am follower of his blog. Made in LA means being accepting. We are proud to have one of the most multi-cultural and diverse workforces in the country. We are a shining example of what it means to work together with people from various backgrounds in a collegial and productive environment. Many people in our company are shaping their American Dream and we are grateful to have the chance to give them that opportunity. We participate in local events where we can, especially on the healthcare front. There is a Digital Health Support group that was started by Susan Williams that brings together healthcare entrepreneurs across LA and it’s been fun to be a founding member of that group. In addition, Katherine Steinberg and the team at Avalere have hosted a regular Healthcare Innovators Breakfast series that has been tremendous. In addition, I personally have been a mentor at Start Engine, a judge for USC’s MMM program and also an Angel investor with the Arena Ventures syndicate. Where is the best place in LA to watch the sunset? Palisades Park in Santa Monica. That place never gets old. It has the best views of the coastline and that great sunset Instagram shot is always a winner with the pier in the background!